A water firm which mistakenly released toxic chemicals into a south London river, killing 7,000 fish, has had its fine reduced by the Court of Appeal. Thames Water was fined £125,000 for spilling a form of bleach into the River Wandle in September 2007 during cleaning at Beddington sewage plant. But three judges ruled that the fine imposed in January 2009 was "manifestly excessive" and cut it to £50,000. 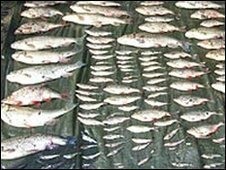 The river turned milky white and fish died in along a 5km (3.1 mile) stretch. Thames Water was fined at Croydon Crown Court last year after it pleaded guilty at Sutton Magistrates' Court to an offence of causing polluting matter to enter controlled waters. Soon after sodium hypochlorite spilled into the river, the Environment Agency received calls from local people about fish "dying or in distress", Howard McCann, prosecuting, told the crown court. Jonathan Barnard, mitigating for Thames Water, said it had pledged to pay £500,000 towards restoring the river's eco system and in aid to the Wandle Trust conservation group. The Environment Agency said the spill had reversed 20 years of conservation work on the River Wandle, once dubbed a "sewer" because of waste from tanneries flowing into it during the industrial revolution. Ruling, Mr Justice Sweeney said: "In our view there is a clear policy need in cases of this type to encourage the making of voluntary reparation by offenders... whilst at the same time ensuring appropriate punishment and deterrence." Lord Justice Moore-Bick, Mr Justice David Clarke and Mr Justice Sweeney heard the case. The 14km (8.7 mile) long River Wandle flows through south London, starting at Croydon and passing through Sutton and Merton before joining River Thames at Wandsworth.